For decades, simply hearing the word ‘presentation’ has sent some people into a heightened state of anxiety. Somewhere along the line the idea of giving a presentation became analogous to going to the dentist or doing your taxes. But that’s starting to change. People and businesses around the world are beginning to realize the inherent power in an opportunity to stand, captivate and inspire a group of people. Day in and day out, I see, hear, create and critique more presentations than I can keep track of. 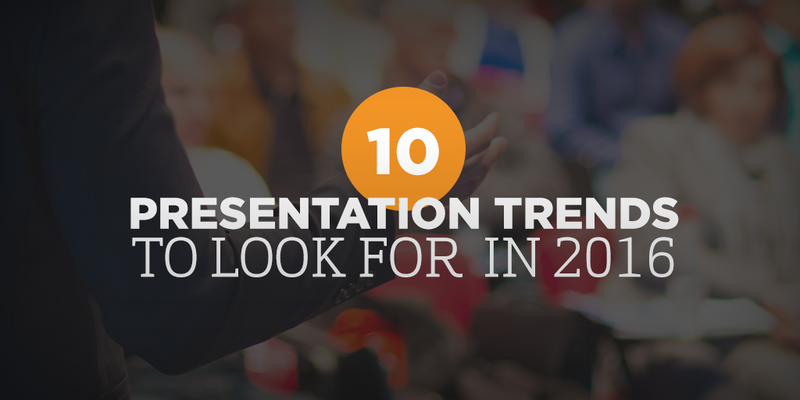 Here are 10 trends in presentations that we’re already seeing take shape that will become even more prominent in 2016. The first ever Microsoft acquisition was a little company that made a product called “Presenter” — now better known as “PowerPoint.” This was in 1987. Fast forward to today when the word “presentation” has become synonymous with “slide deck.” While true, it’s also unfortunate. In 2016 and beyond, people will begin to reverse this trend. For thousands of years, humans effectively communicated without a digital slide display platform. Our biological systems are still programmed to be most receptive to stories and conversations over charts and data points. The growing popularity of TED talks and programs like Shark Tank are showcasing powerful presentations very often void of slide decks. Thankfully, audiences are responding too. They are clamoring for more dialogue, rather than speakers providing a boring one-way monologue. If you wait long enough, what’s old will once again be in vogue. For 2016, that truism is around presenters ditching slides in favor of deeper human-to-human connection. In 2014, an estimated 100,000 selfie sticks were sold in the month of December alone. That number shows no sign of slowing down as people are looking for more and more ways to effectively add technology to their personal being. When you think about it, selfie sticks are simply arm extenders — and the trend of wearable, interactive tech is growing. A few years ago, iPads were all the rage and presentations often went “small” where presenters used the touch devices in small, intimate circles. As iPad-style touch technology finds its way to bigger screens, and the cost of those screens plummet, more people will use the larger version than ever before. From trade show booths to boardrooms to large meeting environments, presenters will look more and more like the local weatherman or sportscaster tapping the screen, drawing lines, making connections and interacting with the physical device. Like a selfie stick, these devices will simply become an extension of ourselves and how we communicate. The 10-second sound bite on a 24-hour news channel. The one-sentence story summaries on the front page of the Wall Street Journal. The entirety of USA Today. The online news aggregators like Mashable and The Daily Water Cooler. This is just a quick sampling of the zillions of examples of information bursts that so many of us consume online, in print and through broadcast daily. These information bursts have become so normal, so commonplace that the majority of us demand our presenters and their presentations to be incredibly concise information bursts too. Watch any group of people during a keynote address. Unless the presenter is at the very top of their game, many audience members will engage with a mobile device in mere seconds of the presentation’s beginning. I’ve personally seen people retreat to their phones in under 30 seconds during presentations I’ve attended. To counter our inability to stay focused, to stay engaged, organizers will shift the style of meetings and events to more rapid fire, TED-style talks. While this response is intended to solve the problem of deep engagement, it unfortunately won’t. Presenters simply need to up their game. A shorter duration will provide some relief for the audience but it won’t increase effectiveness in delivering a message. People are nosy. We want to know what’s going on behind the scenes, in the house next door and the boss’ office down the hall. Don’t believe me? Well, according to recent numbers, Facebook now has over 1.5 billion users and I think we can all agree its only real purpose is to see and be seen. Audiences want to know that presenters have a deep conviction about their work and words. They also want a deep connection, which is why generic, benign examples will go the way of the dodo bird. Extinct. Personal examples, real-life narratives and explicit information based on hands-on experiences will rule the day. For years it’s seemed like every large corporate meeting or event featured a panel discussion filled with industry experts and a mostly capable emcee. These 60 to 90-minute agenda blocks gave quality information and plenty of face time for the panelists. And they typically went okay. But that’s just it…okay. Not great. Not terrible. Mostly safe and void of real controversy. Watch any Sunday morning political show on national television and you’ll see a far more engaged and lively panel discussion. Why? Because the producers pair people with dissenting opinions. It’s bad TV to watch people nod in agreement, we want a fight!! That’s the common cause of the just okay panel; no controversy, no dissension, everyone agrees. Audiences are demanding more, and the just okay panel is going to be replaced by the in-depth, one-on-one, ask me anything style interview. The tech world has done this really well for some time — now every other industry is going to jump on the bandwagon. Oh…and here’s one tip to the emcee, don’t hold back! The question you’re not sure you should ask is the exact question everyone in the audience really wants to hear about. To actually connect, to be genuine and authentic, we need to hear more than just puppy dogs and rainbows. We use our mobile devices for so many of life’s needs. Directions to the post office? No problem. Phone number for Aunt Sally? Can do. Ride to the airport? Too easy. At the same time our mobile phones are getting a workout, our relationship with traditional media has dramatically changed. According to a December 3, 2014 report in the Wall Street Journal, Nielsen reports a 60% increase in online streaming video. In more human words, that means people are watching much more of what they want to watch, when they want to watch it. We are no longer at the behest of the traditional broadcasters. Now, we’re in control and we like it! Well, that’s where presentations are headed too. Using mobile devices, audiences will vote on specific talk tracks a presentation could take. Instantaneous results will be collected and displayed and the presentation will move forward as desired by collective vote. Imagine a conference where the first presenter gets on stage and says, “Which of these four topics would you like me to talk about? Take out your phone and vote now.” Believe it, because it’s happening already. Darn. Shoot. Ah shucks. Dagnabbit! Ninny Muggins. Admit it, you think those five words sound childish, silly, even SpongeBob-like. Well, I’d agree with you and so would the vast majority of audiences. The business world continues to evolve in all manners of technology, marketplaces and types of commerce. Doesn’t it make sense that our accepted language choices could evolve too? Presentations are going to look and sound more like the culture found within the office. The meteoric rise of the boot-strapped start-up and their youthful exuberance and low-brow language will become the norm. Expect F-bombs and terms generally associated with bodily wastes to become commonplace in the business presentation. There’s this stuff, it’s called paper, maybe you’ve heard of it? Well, I know you have because even though all things digital / electronic have been on the steady rise for years, the volume of paper consumed has only dropped by a few percentage points. Yes, magazine paper stock and newsprint have fallen fast, but many other common paper products are holding on. The thing is, people still like paper. In fact, many brands have turned away from digital marketing to old school, traditional paper-based marketing efforts. The American Express Platinum Card is a great example. The whole campaign is centered around a drop-dead gorgeous paper brochure sent via snail mail. It’s so nice you don’t want to throw it away. Presenters have adopted that trick by adding printed workbooks into the mix. Sure, you’re going to hear the, “Will you send us your slide deck?” phrase uttered with reckless abandon, but that simple email prompt might soon be in for a real challenge. These workbooks act as interactive study guides. They provide just enough detail to allow audience participants to follow along, but with plenty of blank space and holes for notes and key ideas to be filled in. Once the presentation is over, in the hands of every audience member lives a perfect scenario in physical form. It’s too tough to simply throw away. Interactive workbooks give a presentation shelf life and they effectively push the presented ideas into a deeper level of understanding. No longer do you get fleeting moments of passive interaction with a presenter. Now you’re fully immersed, pen in hand, adding content as you hear it, allowing the message to take root. I didn’t say this trend was green, but it’s certainly effective. There is no denying the impact Uber has made on the lives of city dwellers across the world. The actual service offering and the interface have quickly become ubiquitous with technically advanced, simple…in short, a better way personified. Uber’s rapid adoption rate and mostly universal praise have made it the go-to parallel when trying to explain a new product or feature. “Simply swipe your phone and your clothes will be magically cleaned. Think of it as the Uber of dry cleaning.” People…STOP! No more. Thousands of pitches and ideas have used this parallel. At this stage, it’s stale, overused and always under-delivers. Sure, audiences immediately understand the simple, smart Uber-style offering, but they actually don’t believe you. You see, Uber is so good that we really don’t believe you’ve created something of that equal. Whether it’s the little car making turns and heading your way or the variety of options from luxury to inexpensive, Uber has radically changed the game. Now, name two other apps or ideas that have succeed in completely disrupting an old model that had stood the test of time. It can’t be done. Not the iPhone, too complex. Not the iPad, too expensive. Nope, Uber stands alone. When people or organizations present using an Uber-like analogy, they are essentially saying “I’m a worldwide phenom, a true game changer, a purple unicorn, a magic narwal.” We don’t buy it. Temper your description and thus temper expectations. Really, just don’t do it, you’ll be better served in the long run. Are you one of the estimated 6.5 million Americans who watched the season finale of ABC’s “Shark Tank” this past September? Perhaps you’re one of the 129 million viewers of the top five most watched TED talks. The numbers are staggering and it’s just the tip of the iceberg. As people spend more time and resources on ingesting content, tastes will mature and modify. The days of being a “just okay” presenter are long gone. Why? Well, because audiences will no longer tolerate mediocrity. We are all well-versed in good versus mediocre, and social media channels and pocket-sized technology will certainly push out the bad. Imagine sitting in a conference room watching a terrible presenter… What are the chances audience members will chat, tweet, post or record the action? VERY HIGH! To combat this sort of critique, presenters will simply need to up their game. Moreover, time has become the most precious commodity we all have. According to a July 3, 2012 article in the Huffington Post, 80% of U.S. workers spend the equivalent of an extra full day of work, per week, working after hours. We have no time for mediocrity. Lousy presentations that don’t engage, inform or excite the audience will simply become blocks of time to accomplish other tasks. Expect audience members to zone out, or even worse, simply leave the room to get other work completed. Even internal meetings will be impacted. No longer will associates tolerate a rambling, unprepared CEO who tries to connect and convince “on the fly.” Sites like Glassdoor will push execs to be prepared and fully engaged in the process. 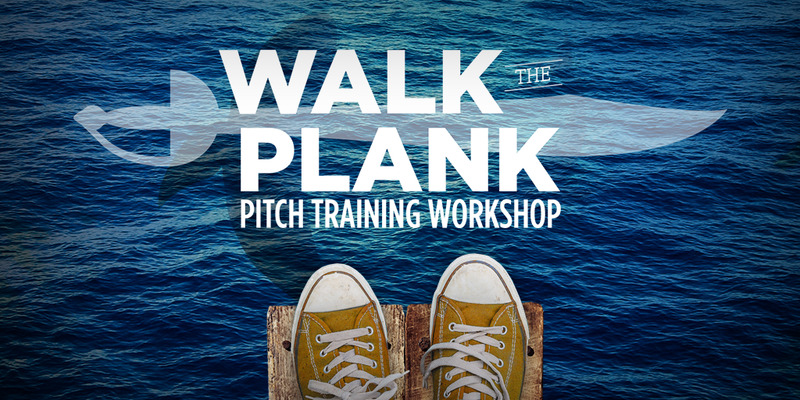 Improve your pitch presentation this year at a Walk The Plank: Pitch Training Workshop by SquarePlanet in Chicago.